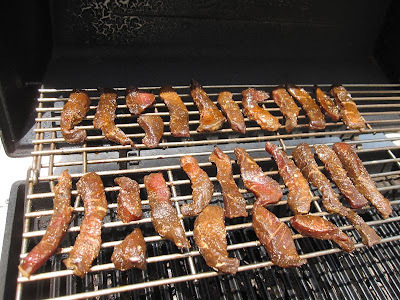 Last month I blogged about my "First Attempt" at making jerky. I used the pickling juice from a jar of pepperoncinis. My thought was that it contained vinegar and salt, which are two common ingredients used for jerky marinade. Combined with the fact that this juice is also quite spicy, I figured it would create some good jerky. That batch didn't quite work out the way I had hoped. I couldn't taste much of the marinade. I had only marinated it for 2 hours. So, a couple of days I tried this recipe again. This time I marinated it for 2 days. This time I got the full flavor of that pepperoncini juice. Except it tasted like crap when used as a beef jerky marinade. I took one bite, and chewed it a little, and had to spit it out. I threw the rest of the jerky away. 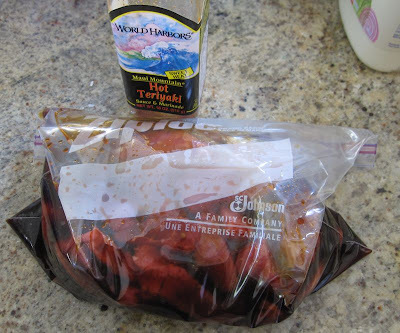 If you want the full taste of the marinade, you must marinate for at least 24 hours, or longer. 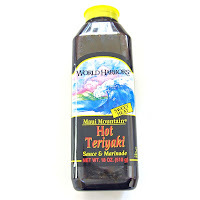 For my second batch of jerky, I found this bottle of World Harbors Hot Teryaki sauce at my local Albertson's grocery store. It sounded really good for a jerky marinade. So I bought it. When I opened the bottle and tasted the sauce, I thought, "Oh yeah!, this IS the bomb". It's a sweet teriyaki, with a spicy hot kick. 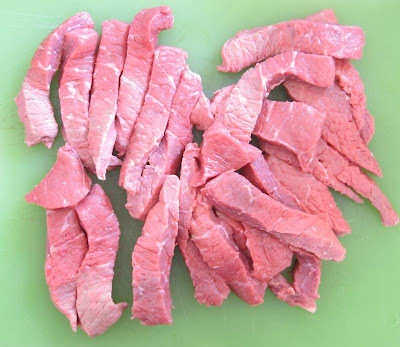 I bought a package of beef bottom round, trimmed off the fat and gristle, and sliced the meat into strips, slicing against the grain. I put the beef strips into a Ziploc bag and poured the teriyaki sauce in. I let this sit for 24 hours (well technically, 23.5 hours is what I did). Most instructions say to marinate in the refrigerator, however I let it sit on the kitchen counter. My thinking is that colder temps in the refrigerator will cause the meat to contract, and make it difficult for the marinade to soak in, whereas the warmer room temperature will do the opposite. I'm not sure if it made any difference. After marinating, I laid the strips on the upper rack of my BBQ grill. Then I sprinkled on some "Szechuan Pepper" blend from Schilling, using just a light sprinkling. 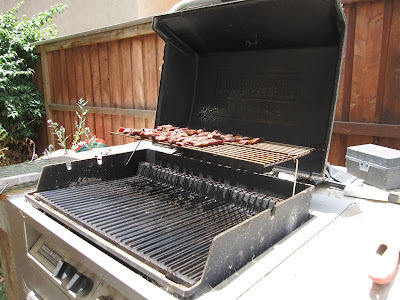 Unlike with my first batch of jerky, I kept the lid to my BBQ grill wide open. I also started this during the heat of the Summer, around 1:00pm, whereas with the first batch I started at 7:00pm. I set the flame to its lowest setting, and only used the right burner, with the meat positioned opposite (middle-to-left) of on the grill. The heat needs to be kept around 150 degrees F, hot enough to help the meat dehydrate, without actually cooking it. You don't want it to cook. I stood around for about 30 minutes to see if the heat was too low, or still too hot, and it seemed be ok, particularly with the sun beating right down on it. I was also concerned about flies landing on the meat, but I think there was just enough heat from the grill that they kept away (I could see them flying around hoping to land). After about 4 hours, the meat still wasn't totally ready. I tried a piece and it was very chewy, and still obviously a little raw. I turned over the meat, sprinkled some more seasoning, and this time closed the BBQ lid about half-way, using a garden-shovel to jam the lid open. About 2 more hours later, I rechecked, and tried a piece. It definitely was not as chewy as it was earlier, and so I opted to remove it from the grill, and shut it off. Well, not bad, but not what I expected. I'd rate this as "fair" on my beef jerky rating system. The hot teriyaki sauce is noticeable, but doesn't have the same taste as it did from the bottle. It's a little more watered down tasting. But, I can taste it in the meat itself. It's not as hot as it was from the bottle. That's a big disappointment for me. I can taste the natural meat flavors somewhat. I'd like to know specifically what causes that flavor to come out, in the same way I found with brands like Big John's Jerky, Gary West Meats, or Rives Quality Meats. I'm wondering if some kind of aging is involved, either before or after marinating. Or maybe it's aged after packaging as it sits for a few days. Or perhaps, smoking enhances that flavor. Note that I did not smoke this meat. The Szechuan Pepper seasoning seems just about right. It's just enough to taste, but doesn't overpower. 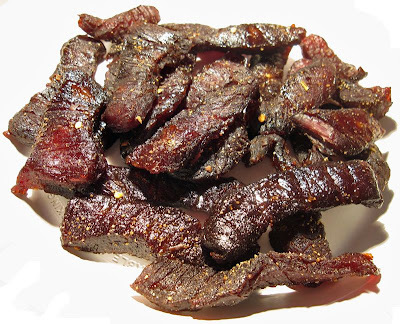 As for the meat consistency, it has a very steak-like chewing texture. For the most part, it's a soft, semi-moist chew, and very nice to snack on. Some strips are still a little tough, and I do find chunks of unchewable tissues in this meat. Perhaps that's an aspect of bottom round instead of top round. I also found some thicker strips still very chewy, as if they're still a little raw. I did not add salt to this marinade because I figure the Hot Teriyaki marinade already has salt. This jerky could use a little more salt, however. I think I'll stick with my use of the BBQ grill, since this isn't too bad. I need to slice the strips a little more thin, and keep them the same thickness, to ensure a consistent texture. I think the next batch I'm going to try top round, instead of bottom round. 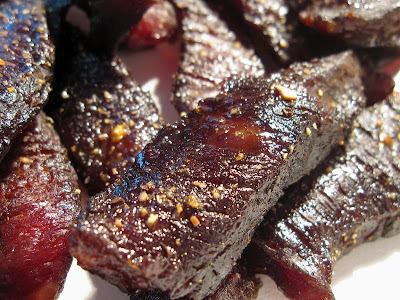 I need to do more reading on jerky recipes to figure out what brings out that natural meat flavor.